The PMP exam is all about questions. That’s a little obvious, I know. But think about it for a minute: you’ve got 4 hours to answer 200 questions. It’s a nerve-wracking situation if you’re not in the habit of taking exams — and few professionals are. 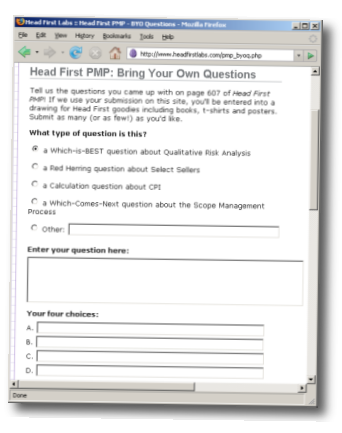 That’s why one of the best ways that you can prepare for the PMP exam is to write your own questions. But don’t you need to be an expert to write your own questions? Definitely not! It turns out that there are only a few ways that make sense for presenting the kind of information you’ll see on the PMP exam. Getting a good feel for them will really help you get more comfortable with the material, and it will help you separate the ideas being tested on from the wording of the question. Most of all, it will help you think more about the material, and come up with practical situations on your own for applying it. And that’s a very effective way to study. It’s hard to know where to start, though. It turns out that writing good questions takes practice. That’s why Jenny and I added the “Question Clinic” Lose Weight Exercises to Head First PMP. It turns out that a lot of the questions on the exam fall into just a few categories. There are different strategies for each kind of question, so recognizing the question type can help you get more answers right. But even better, being familiar with how questions work can really help keep you calm on the exam, because you’re faced with a lot fewer surprises. Pretty neat, right? And don’t forget: any time you run into a fact that you don’t know, or if you get a question wrong on a practice exam, write your own question for it. It’s a great way to get the information to stick to your brain!